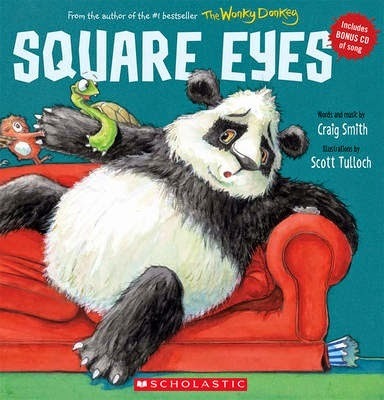 Craig Smith, who brought us the phenomenally successful The Wonky Donkey (KBR review), adds another fun sing-a-long story for kids to his repertoire with Square Eyes. As you can probably guess from the title, Square Eyes features a group of characters (a rather cute panda and his animal friends) who spend way too much time sitting in front of the television. The lyrics of the song, illustrated by Scott Tulloch, encourage Panda and his friends to take some time away from the television to exercise and find other fun things to do like reading, playing games, visiting the library and using their imagination. You can splash all day. Please let it stay that way. The catchy song, quirky lyrics and appealing illustrations make this book ideal for classroom activities for younger children to reinforce the importance of being active and balancing screen time with other hobbies. The book includes a bonus CD of the song performed by Craig Smith.